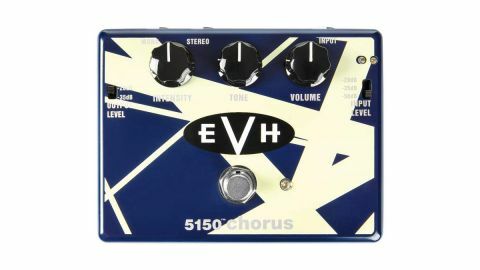 If you’re an EVH fan, this pedal is another one to add to the collection. Pad switches accommodate different usages. Stripy graphics obscure some labeling. Prominent battery compartment lid might cause problems for pedalboard mounting with Velcro. Eddie Van Halen has used a variety of chorus pedals in his time (as well as rackmount Eventide Harmonizers for detuning), but this new pedal is based on a chorus unit that he used in the early 80s - although, for now at least, MXR is not saying which one. Based on the controls, our guess is that it’s the Roland DC-30, a table top/rackmount unit as seen in Eddie’s onstage rig during that era. The DC-30 (and its Boss DM-300 twin) offered BBD analogue delay plus chorus with the Intensity, Tone and Volume knobs, as well as the input and output pad toggle switches seen here. Those pad switches on the 5150 let you set it up for a variety of input and output sources - direct guitar, effects loop, and so on. The Volume knob sets overall output, running from zero with unity gain at about 1 o’clock with (passive guitar-friendly) 35dB input and -20dB output level pad settings, so there’s plenty extra if you want a gain boost. To the left, the Tone knob offers a fat warm sound that gets leaner as you turn it, the top-end remaining intact at all times. The overall effect of this new pedal is to add an extra dimension to your sound. This is a classy chorus - spacious with a sense of more than one instrument playing, but without the obvious warble you’d get from higher rate settings. That single Intensity knob (rather than separate Rate and Depth) is also typical of early Roland chorus as seen in the CE-1 and RE-301, and seems to be adjusting a range of parameters. Our favourite sounds are found in the first half of the Intensity knob’s travel - head further still and the subtlety dissipates as the pitch shift gets more wayward. As might be expected, this pedal really shines with driven tones, either in front of a distorted amp or after a dirt pedal, and while mono operation sounds great, it’s with stereo width that the results are quite spectacular. If you’re an EVH fan, this pedal is another one to add to the collection and will help you recreate Diver Down tones such as those on the (Oh) Pretty Woman track. For other players, the 5150 Chorus offers an otherworldly dislocation of sound, adding interest and making everything huge.